Seven Beland: These Bollywood Posters With A Stinking Twist Will Make You Swear Off Littering! For Good! These Bollywood Posters With A Stinking Twist Will Make You Swear Off Littering! For Good! India Times 25 September 2015: Did you know that Delhi‬ produces 8,500 tonnes of solid waste, 5,000 tonnes of electronic waste, 500 - 600 million gallon of sewage and 10 metric tonnes of bio-medical waste everyday? However, only 5% of this is recycled! 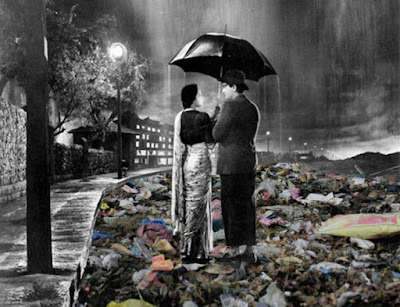 Artist Shaily Gupta and Karma Recycling, a turnkey manager of waste have started a social campaign to make people aware of waste recycling by replacing the exotic romantic places in famous Bollywood scenes with thrash and garbage dump. The posters are all over Delhi, grabbing attention and spreading awareness on waste management. 1. Imagine the open road where Raj Kapoor and Nargis walked with a single umbrella in Shree 420? Now imagine that covered in trash.